You like to do a thousand things at the same time while playing online games. Jump and reload while overrunning the enemy hordes and post the teammate in the group the number of today's victories. For a standard keyboard these functions are usually far apart and can not be assigned that easily. 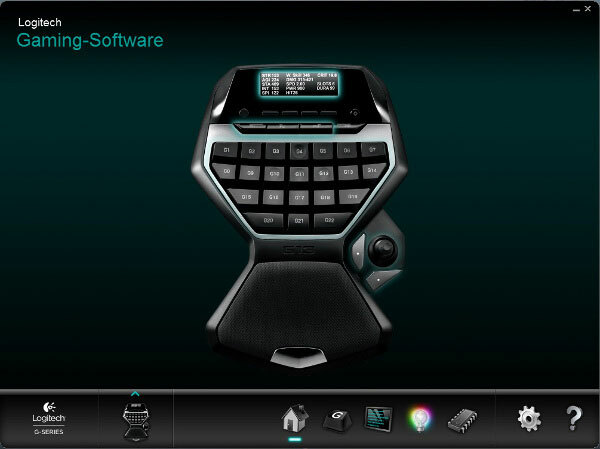 Here Logitech offers a solution with their G13 Gameboard. It is a little extra keyboard which is supposed to find its place next to the normal keyboard. Full of features and options, it is an useful supplement for every gamer desk. 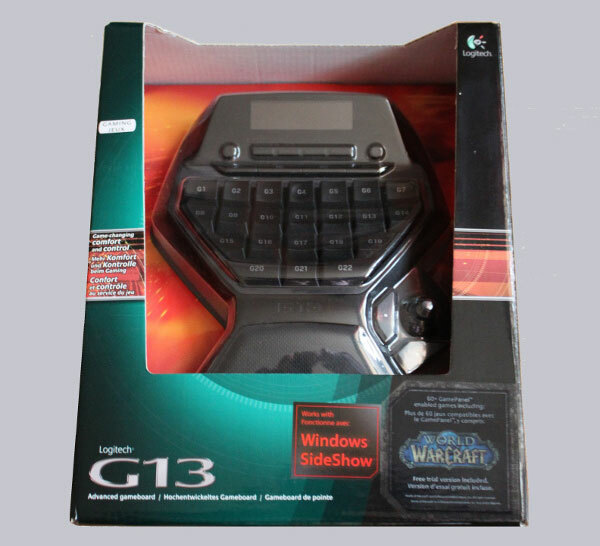 The Logitech G13 comes in the usual blister packaging. Unfortunately, the G13 Gameboard has a limited scope of supply which contains only the Gamingboard and a Booklet. Delivering a small cloth for cleaning the Display would be useful. The board has a 3-year limited hardware warranty (may vary in some countries). The board has the following dimensions: 171 mm x 243 mm x 38 mm (WxDxH), and weights approximately 600 grams. This provides a firm stand and keeps the board even with fast keystroke in place. The device is connected via a 2.43 meter long USB 2.0 cable. 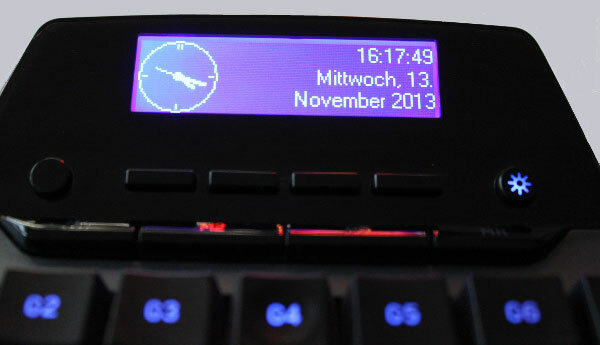 At the upper end of the G13, the dot-matrix LCD offers a resolution which is 160 x 43 pixels. The 4 menu buttons are located underneath the display. Slightly off its left lies a separate knob to select the respective display content. On the right side of the menu buttons is another button for switching the backlight on and off. Located directly under the menu button bar are the buttons that can quickly call or save profiles, together with assignments. Centered on the board is the 20-key keyboard with rubberdome Keys. The keyboard is flanked on the right by an additional control pad consisting of a stick with 4 direction buttons,a center button and two additional buttons. At the lower end is the generously sized palm rest, which also offers large hands enough bearing surface. Through its rubberized surface, it provides a solid grip. Basically, you should always download the latest drivers for the new hardware from the manufacturer's website. The G13 is no exception. 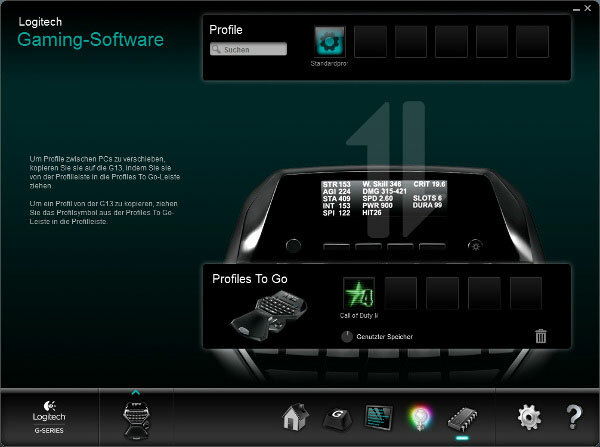 When the current drivers are installed and the game board plugged into your PC via USB Cable, you can open the Logitech game software that is currently available in the current version 8.50 of 26th August 2013. This leads to a bunch of functions of the board including all the settings. 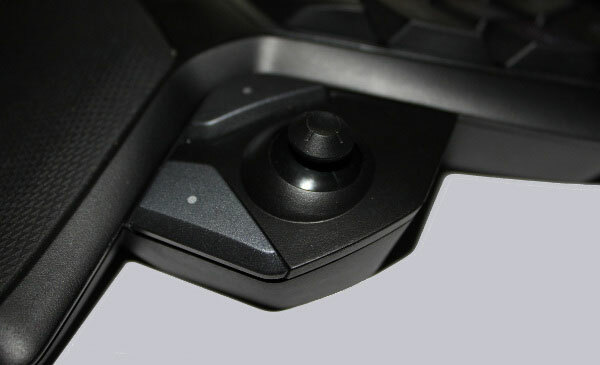 A small model of the G13 contains clickable areas to select the functions easier. 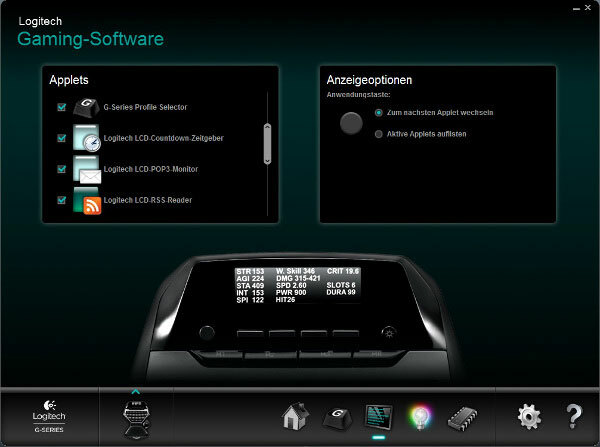 Choosing the LCD display, you get the ability to adjust the backlight using a color palette. Furthermore, there is a small selection of programs, known as applets, which provide various displays on the screen. 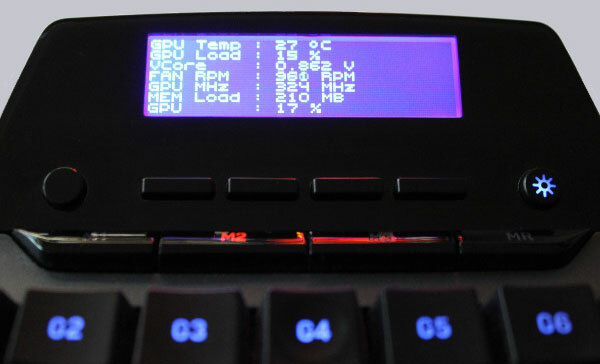 For example, a clock display or the current CPU utilization. 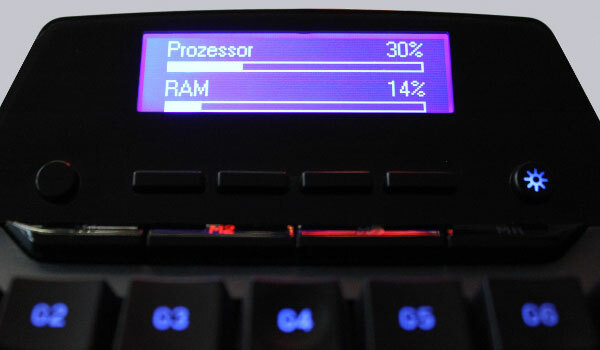 Even external programs such as the tool Afterburner from MSI are able to show GPU Temperature and/or voltages on the G13 LCD. All 22 buttons and the stick is free assignable. You can manage the assignments with the M-Buttons. The device has an internal memory of 20 MB to accommodate configurations and make them available on other computers. Spacebar, Shift and Ctrl keys are a little different to the other keys to make it easier to get used to that type of keyboard. 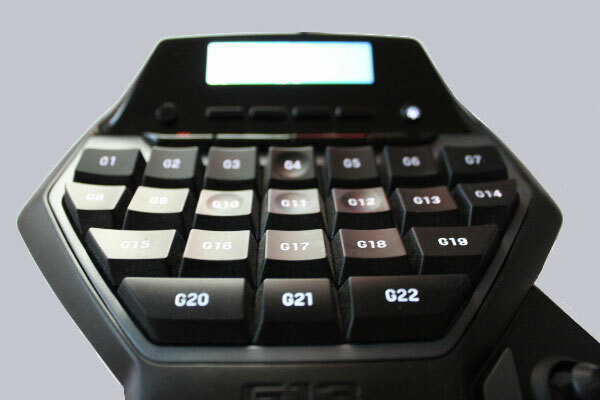 The G4 and G10-G12 keys (WASD keys) have a slight depression in the middle also to make it easier for the user. Unfortunately, the G13 is only suitable for right-handed users. Left-handed Gamers are not able to use the Stick and the Buttons anymore. 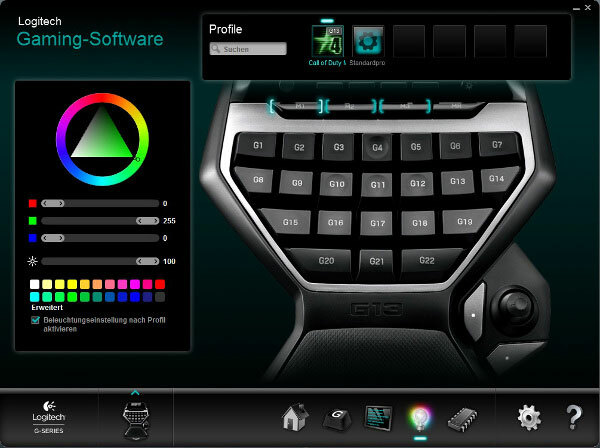 The Logitech G13 Advanced Gameboard USB is a useful device, which reduces the wearing of some much more expensive keyboards and still provides useful features such as the LCD display. 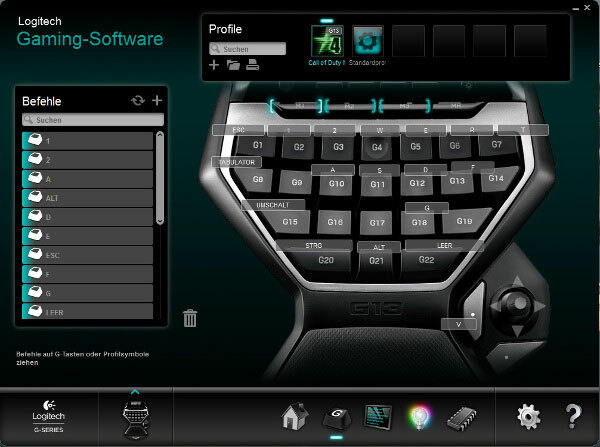 Also increased by the fact that the user is able to assign the keys freely it can higher the effectiveness of playing. In terms of ergonomics Logitech can definitely make further amendments, because many users complain about the bad hand position and accessibility of some keys. Others criticize the poor resolution of the LCD and why there is no color display used, such as in its big brother, the G19. For the relatively low price the G13 has a good scope and is affordable. 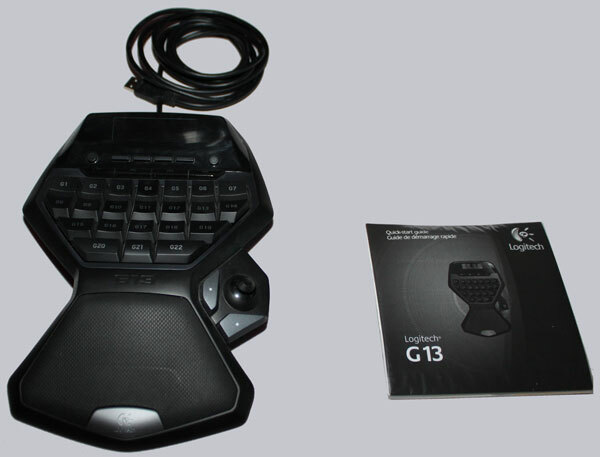 Here you can order the Logitech G13 Advance Gameboard USB. The cable does not have any external damage. The keys still work and we can not recognize any signs of fatigue. degree of dirtiness can be noticed which can be removed with a little more effort and plastic cleaner. Also the LCD and illumination have no defects. The website G-15 applets still exists and publishes, thanks to the diligent user, repeatedly applets even for current games.